Gamers have been picking up next-generation systems in droves, with both Sony and Microsoft claiming to have sold a million consoles within the first 24 hours of launch. It’s well known that many gamers have a preference leaning towards one company or another—and often the rationale behind that decision comes down to an unsung piece of equipment. Both companies revamped their respective designs, although the changes aren’t particularly drastic, a la when Nintendo unveiled its Wii Remote. In many ways, both controllers owe their basic design—two analog sticks, four face buttons, four triggers—to Sony’s original DualShock, released all the way back in May 1998. The Xbox One’s controller closely resembles the original Xbox’s redesigned Controller S, but it has a host of subtle improvements over its predecessors. For one, the rumble functionality is vastly improved; playing Ryse, the tactile feedback from a sword hit differs from throwing a spear. It’s subtle, but it improves the immersion of the experience tremendously—something that Microsoft, with its emphasis on Kinect, no doubt focused on. Gone is the bulky battery pack on the back of the controller; now the back is smooth, which proves much more comfortable for long play sessions. The D-Pad is also much improved, with a solid feel far superior to the mushy, unusable mess on the 360. 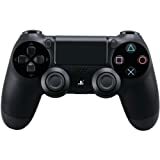 PS4-wise, it’d be easy to mistake the DualShock4 for the DualShock3 at first glance, save for one interesting feature; the touchpad placed right in the center of the controller. It’s even clickable. But there are other key differences, too. The pad also has subtle curves—which aren’t easy to see from a dead-on shot—that make it easier to grip than its squared-off predecessor. The ergonomics are much improved, and the layout feels less bunched up as a result. Subtle changes, given that the DualShock3 was an excellent pad already, but ones that gamers should be happy about. TheDualshock 4 also has an ps4 charging station interesting feature that the Xbox One’s pad lacks: a light bar at the top of the controller, which can display a number of different colors. Sony claims that this is helpful for distinguishing players in multiplayer games, but it could also have other applications as well, such as warning a player when they’re low on ammo or health. There’s also a Wiimote style speaker in the center of the controller, which chimes and plays other various messages. One essential piece of equipment you will need with either controller is the Xbox One Play and Charge Kit or the ps4 charging station to save money on batteries. Overall, it appears that Microsoft focused on refinement; the Xbox One’s controller is an improvement over the well-received Xbox 360 pad, and gamers familiar with Microsoft’s previous efforts should be pleased. Sony took the DualShock’s design and threw an interesting array of technological features—the light bar, the touchpad, the speaker—in, which is curious, given the company’s decision to release the PlayStation 4 Camera separately. It appears that Sony is aiming to enhance immersion through the actual controller that players hold, rather than an ancillary device. It remains to be seen who made the correct call, but what’s certain is that both companies have stepped up their game with their next-gen controllers—something all players should be pleased about. Easy system navigation – PlayStation Camera enables hands-free navigation of the PS4 system menu – Login instantly with face recognition as well as search your library and launch games with voice commands. Head tracking and Gesture tracking – Gain an advantage on your enemy using head tracking to peek around corners in Alien: Isolation. Put your gaming in motion as you control in-game actions through your dance moves in Just Dance 2015. Voice commands – Quickly change tactics such as making player substitutions with voice commands in FIFA 15. Innovative gameplay possibilities – Put yourself in the game by creating a custom player using the face scan feature in NBA 2K15. Have fun with the family and imagine the innovative possibilities with The Playroom, a pre-installed app on Playstation 4 systems. Broadcast your gaming greatness – Live Broadcast your PS4 gameplay and add picture-in-picture video of yourself with PlayStation Camera. Share your gaming mastery and expert knowledge to build an audience of admirers.